For mounting of technological and decorative items to concrete and masonry surfaces when carrying out repair work in most cases used the dowel-nails. Due to the large friction forces and high reliability of the connection. Score the dowel-nail can only pre-prepare under it bore. 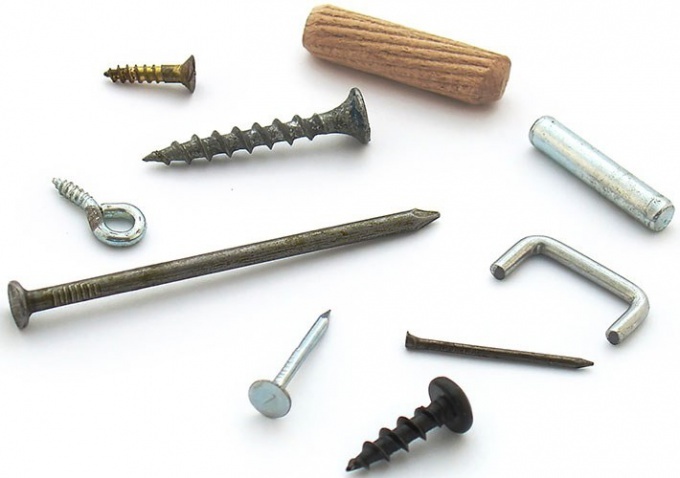 Select and prepare all the necessary tools for hammering the dowel-nails. If the work will be conducted on concrete, you will need a drill or electric drill with a bump. If the dowels are supposed to hammer into the brick surface, suitable for hand drill or even a brace. In both cases you will need a drill for concrete. Its diameter (usually stamped on the shank) should correspond to the setting of the dowels, and the length of the working part (groove) to be at least 5 mm longer the full length of the dowel. Also prepare a hammer and punch. Select a place that will be full of the dowel-nail. Check whether there is enough wall thickness (floor, ceiling) so that when drilling not to penetrate it through and through. Make sure that this place is not the wiring runs hidden in the grooves or channels in plates. If you have to drill the concrete, try to choose a place so as not to get into metal fittings. When working with brick structures avoid parts masonry cement, because the dowel will stay very bad. Mark the selected location. Drill out the bore hole under the dowel. In order that the drill is not "left" to side with the planned places at the beginning of the process (especially when working with a hammer or a drill for concrete), knock a small hole in the surface with a punch and hammer. Fit the drill. Start at low speed. After the drill, deepen at least 5 mm, it is possible to increase the rotation speed of the drill. The brick is to drill gently, not including the hammer. Hammer the dowel-nail. Remove from the planting hole dust. Enter the end of the dowel. Light hammer blows began to pound his full length. If the plug was damaged in the driving process, remove it with pliers and use a new one.